This document describes how iptables and ebtables filtering tables interact on a Linux-based bridge. Getting a bridging firewall on a 2.4.x kernel consists of patching the kernel source code. The 2.6 kernel contains the ebtables and br-nf code, so it doesn't have to be patched. Because the demand was high, patches for the 2.4 kernel are still available at the ebtables homepage. The br-nf code makes bridged IP frames/packets go through the iptables chains. Ebtables filters on the Ethernet layer, while iptables only filters IP packets. The explanations below will use the TCP/IP Network Model. It should be noted that the br-nf code sometimes violates the TCP/IP Network Model. As will be seen later, it is possible, f.e., to do IP DNAT inside the Link Layer. We want to note that we are perfectly well aware that the word frame is used for the Link Layer, while the word packet is used for the Network Layer. However, when we are talking about IP packets inside the Link Layer, we will refer to these as frames/packets or packets/frames. This section only considers ebtables, not iptables. First thing to keep in mind is that we are talking about the Ethernet layer here, so the OSI layer 2 (Data link layer), or layer 1 (Link layer, Network Access layer) by the TCP/IP Network Model. A packet destined for the local computer according to the bridge (which works on the Ethernet layer) isn't necessarily destined for the local computer according to the IP layer. That's how routing works (MAC destination is the router, IP destination is the actual box you want to communicate with). There are six hooks defined in the Linux bridging code, of which the BROUTING hook was added for ebtables. The hooks are specific places in the network code on which software can attach itself to process the packets/frames passing that place. For example, the kernel module responsible for the ebtables FORWARD chain is attached onto the bridge FORWARD hook. This is done when the module is loaded into the kernel or at bootup. Note that the ebtables BROUTING and PREROUTING chains are traversed before the bridging decision, therefore these chains will even see frames that will be ignored by the bridge. You should take that into account when using this chain. Also note that the chains won't see frames entering on a non-forwarding bridge port. ignore it, if the destination MAC address is located on the same side of the bridge. Ebtables has three tables: filter, nat and broute, as shown in Figure 2c. The broute table has the BROUTING chain. The filter table has the FORWARD, INPUT and OUTPUT chains. 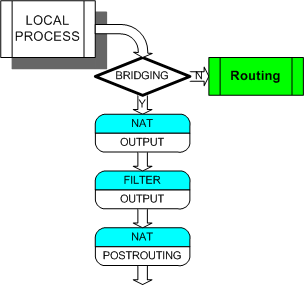 The nat table has the PREROUTING, OUTPUT and POSTROUTING chains. 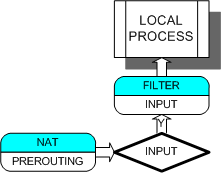 The filter OUTPUT and nat OUTPUT chains are separated and have a different usage. Figures 2b and 2c give a clear view where the ebtables chains are attached onto the bridge hooks. A brouter is a device that bridges some frames/packets (i.e. forwards based on Link layer information) and routes other frames/packets (i.e. forwards based on Network layer information). The bridge/route decision is based on configuration information. A brouter can be used, for example, to act as a normal router for IP traffic between 2 networks, while bridging specific traffic (NetBEUI, ARP, whatever) between those networks. 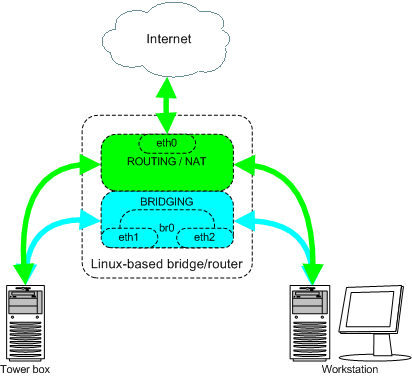 The IP routing table does not use the bridge logical device, instead the box has IP addresses assigned to the physical network devices that also happen to be bridge ports (bridge enslaved NICs). The default decision in the BROUTING chain is bridging. Next the frame passes through the PREROUTING chain. In this chain you can alter the destination MAC address of frames (DNAT). If the frame passes this chain, the bridging code will decide where the frame should be sent. The bridge does this by looking at the destination MAC address, it doesn't care about the Network Layer addresses (e.g. IP address). If the bridge decides the frame is destined for the local computer, the frame will go through the INPUT chain. In this chain you can filter frames destined for the bridge box. After traversal of the INPUT chain, the frame will be passed up to the Network Layer code (e.g. to the IP code). So, a routed IP packet will go through the ebtables INPUT chain, not through the ebtables FORWARD chain. This is logical. Otherwise the frame should possibly be sent onto another side of the bridge. If it should, the frame will go through the FORWARD chain and the POSTROUTING chain. The bridged frames can be filtered in the FORWARD chain. In the POSTROUTING chain you can alter the MAC source address (SNAT). Locally originated frames will, after the bridging decision, traverse the nat OUTPUT, the filter OUTPUT and the nat POSTROUTING chains. The nat OUTPUT chain allows to alter the destination MAC address and the filter OUTPUT chain allows to filter frames originating from the bridge box. Note that the nat OUTPUT chain is traversed after the bridging decision, so this is actually too late. We should change this. The nat POSTROUTING chain is the same one as described above. It's also possible for routed frames to go through these three chains when the destination device is a logical bridge device. Here is the iptables packet traversal scheme. Note that the iptables nat OUTPUT chain is situated after the routing decision. As commented in the previous section (when discussing ebtables nat), this is too late for DNAT. This is solved by rerouting the IP packet if it has been DNAT'ed, before continuing. For clarity: this is standard behaviour of the Linux kernel, not something caused by our code. Figures 3a and 3b give a clear view where the iptables chains are attached onto the IP hooks. When the bridge code and netfilter is enabled in the kernel, the iptables chains are also attached onto the hooks of the bridging code. However, this does not mean that they are no longer attached onto their standard IP code hooks. For IP packets that get into contact with the bridging code, the br-nf code will decide in which place in the network code the iptables chains will be traversed. Obviously, it is guaranteed that no chain is traversed twice by the same packet. All packets that do not come into contact with the bridge code traverse the iptables chains in the standard way as seen in Figure 3b. The following sections try, among other things, to explain what the br-nf code does and why it does it. It's possible to see a single IP packet/frame traverse the nat PREROUTING, filter INPUT, nat OUTPUT, filter OUTPUT and nat POSTROUTING ebtables chains. Figures 3c and 3d assume the IP packet arrived on a bridge port. What is obviously "asymmetric" here is that the iptables PREROUTING chain is traversed before the ebtables INPUT chain, however this cannot be helped without sacrificing functionality. See the next section. Take an IP packet received by the bridge. Let's assume we want to do some IP DNAT on it. Changing the destination address of the packet (IP address and MAC address) has to happen before the bridge code decides what to do with the frame/packet. So, this IP DNAT has to happen very early in the bridge code. Namely before the bridge code actually does anything. This is at the same place as where the ebtables nat PREROUTING chain will be traversed (for the same reason). This should explain the asymmetry encountered in Figures 3c and 3d. One should also be aware of the fact that frames for which the bridging decision would be the fourth from the above list (i.e. ignore the frame) will be seen in the PREROUTING chains of ebtables and iptables. The wish to be able to use physical devices belonging to a bridge (bridge ports) in iptables rules is valid. Knowing the input bridge ports is necessary to prevent spoofing attacks. Say br0 has ports eth0 and eth1. If iptables rules can only use br0 there's no way of knowing when a box on the eth0 side changes its source IP address to that of a box on the eth1 side, except by looking at the MAC source address (and then still...). With the iptables physdev module you can use eth0 and eth1 in your iptables rules and therefore catch these attempts. Figure 6a. Chain traversal for routing, when the bridge and netfilter code are compiled in the kernel. All chains are now traversed while in the bridge code. This is the work of the br-nf code. Obviously this does not mean that the routed IP packets never enter the IP code. They just don't pass any iptables chains while in the IP code. Note that the iptables nat OUTPUT chain is traversed while the packet is in the IP code and the iptables filter OUTPUT chain is traversed when the packet has passed the bridging decision. This makes it possible to do DNAT to another device in the nat OUTPUT chain and lets us use the bridge ports in the filter OUTPUT chain. Figure 7a. Very basic setup. The default gateway for 172.16.1.2 and 172.16.1.4 is 172.16.1.1. 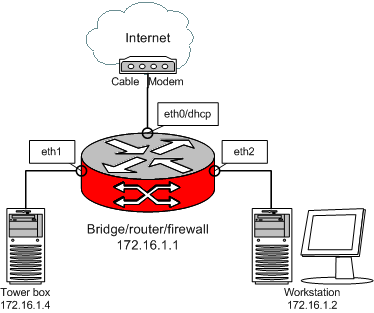 172.16.1.1 is the bridge interface br0 with ports eth1 and eth2. The idea is that traffic between 172.16.1.4 and 172.16.1.2 is bridged, while the rest is routed, using masquerading. Figure 7b. Traffic flow for the example setup. The catch is in the first line. Because the iptables code gets executed for both bridged packets and routed packets, we need to make a distinction between the two. We don't really want the bridged frames/packets to be masqueraded. If we omit the first line then everything will work too, but things will happen differently. Let's say 172.16.1.2 pings 172.16.1.4. The bridge receives the ping request and will transmit it through its eth1 port after first masquerading the IP address. So the packet's source IP address will now be 172.16.1.1 and 172.16.1.4 will respond to the bridge. Masquerading will change the IP destination of this response from 172.16.1.1 to 172.16.1.4. Everything works fine. But it's better not to have this behaviour. Thus, we use the first line to avoid this. Note that if we would want to filter the connections to and from the Internet, we would certainly need the first line so we don't filter the local connections as well. Through some groovy play it is assured that (see /net/bridge/br_netfilter.c) DNAT'ed packets that after DNAT'ing have the same output device as the input device they came on (the logical bridge device which we like to call br0) will go through the ebtables FORWARD chain, not through the ebtables INPUT/OUTPUT chains. All other DNAT'ed packets will be purely routed, so won't go through the ebtables FORWARD chain, will go through the ebtables INPUT chain and might go through the ebtables OUTPUT chain. The side effect explained here occurs when the netfilter code is enabled in the kernel, the IP packet is routed and the out device for that packet is a logical bridge device. The side effect is encountered when filtering on the MAC source in the iptables FORWARD chains. As should be clear from earlier sections, the traversal of the iptables FORWARD chains is postponed until the packet is in the bridge code. This is done so we can filter on the bridge port out device. This has a side effect on the MAC source address, because the IP code will have changed the MAC source address to the MAC address of the bridge device. It is therefore impossible, in the iptables FORWARD chains, to filter on the MAC source address of the computer sending the packet in question to the bridge/router. If you really need to filter on this MAC source address, you should do it in the nat PREROUTING chain. Agreed, very ugly, but making it possible to filter on the real MAC source address in the FORWARD chains would involve a very dirty hack and is probably not worth it. This of course makes the anti-spoofing remark of section 6 funny. Joshua Snyder (<josh_at_imagestream.com>) made a detailed picture about the IP packet flow on a Linux bridging firewall. Jan Engelhardt made a more up to date picture, based on Joshua's picture. Permission is granted to copy, distribute and/or modify this document under the terms of the GNU Free Documentation License, Version 1.1 or any later version published by the Free Software Foundation, with no Invariant Sections, with no Front-Cover Texts, and with no Back-Cover Texts. For a copy of the license, see "GNU Free Documentation License". Last updated November 9, 2003.